These tiny beetles are fairly uncommon but because they resemble mites or even bed bugs they get a lot of reaction from homeowners when they are found. Spider beetles are small (1.5 - 4mm), shiny, hump-backed, reddish-brown beetles that are considered to be minor stored product pests (infest stored foods and natural fabrics). They are usually not a major problem in homes but can damage museum collections of animals and dried insects. These beetles are especially common in older buildings. On first sight people sometimes mistakenly identify spider beetles as mites or bed bugs. They are of course completely unrelated to either of these critters. The majority of questions I get about spider beetles come from New York City but these beetles occur in other regions of the country as well. There are at least three species that can be found in homes. Since spider beetles are general scavengers they can infest a wide variety of organic debris so finding a few beetles is generally not a reason for concern. Cleaning and food source elimination is usually enough to manage the infestation. Insecticides are not needed nor are they very effective in this case. 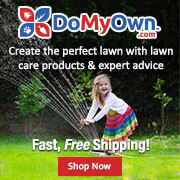 Identification and control tips for a wide variety of other household pests can be found at our main site LivingWithBugs and DIY pest control supplies, including traps and baits, can be found here. 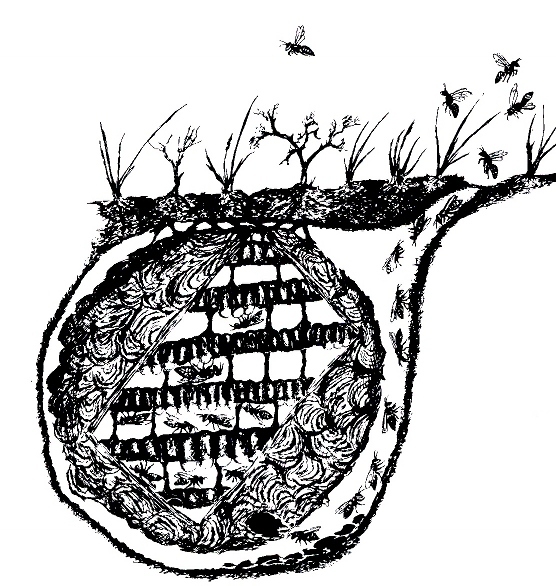 Mites live on plants, in the soil, in our homes, and sometimes even on us! Mites are among most abundant and diverse animal groups on earth. 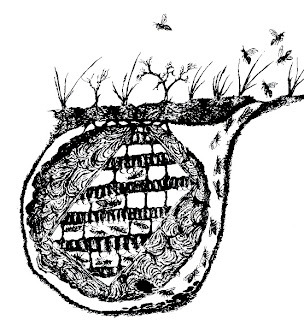 Mites occur literally everywhere; in our homes, on our garden plants, in the soil at our feet, and some even live on us -- so it is indeed a good thing that most are so small that they are barely visible! 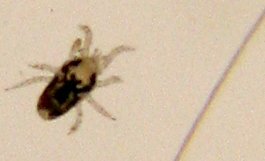 A "typical" mite is about the size of a grain of salt but some, such as ticks (yes, ticks are a type of mite), can be as large as your fingernail while others like the demodex follicle mite (left) are small enough to live inside a normal hair follicle, with room to spare. Mites are related to spiders but they are much more abundant and diverse than their arachnid cousins. While all spiders are predators (i.e. they feed on live prey) mites exhibit a range of lifestyles from the small plant feeding spider mites to tiny ectoparasitic scabies mites and to the relatively large, free-living predatory mites that can be found in most soils. Mites usually have eight legs like spiders but they don't have the distinct separation between the head/thorax (called the "cephalothorax") and abdomen (the part behind the legs) that is seen in spiders. 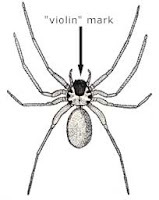 Notice the narrow "waist" between the legs and abdomen in the drawing of the brown recluse spider (see drawing), but the lack of this same constriction in the follicle mite (see drawing above). 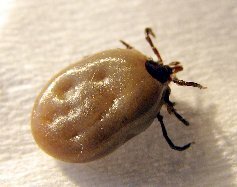 This blog is about the mites that bite people and pets as well as those that feed on plants (plant pests). I'll discuss the identification and new control methods for scabies/mange mites, demodex follicle mites, chigger mites, ticks, mold/dust mites (these mites don't bite but can cause allergy), bird/nest/rodent mites, and pymotes (pyemotes) mites, and many others. Most mites are so small you'll need some sort of magnification to tell what you've got. Many are about the size of the period (.) on a printed page. A good hand lens is sometimes enough, especially if you know what you are looking for, but a microscope may be needed to clearly see others. Mites typically have 8 legs (4 pair) like spiders but some newly hatched mites only have 6 legs (for example chigger mites) and some have only 2 pair (for example the plant-feeding eriophyid mites. Many mites are covered with hairs or "setae". These hairs can cause an allergic reaction in some people. Two notable examples of this are mold mites and dust mites, which in fact are closely related to each other. A good way to collect mites is to use a damp Q-tip to carefully pick them up and transfer them to a vial of 70% rubbing alcohol. Don't stick samples to tape as this can make identification very difficult. In the US samples can often be submitted to your state university for identification. Contact your local Cooperative Extension office (www.extension.org) for details.